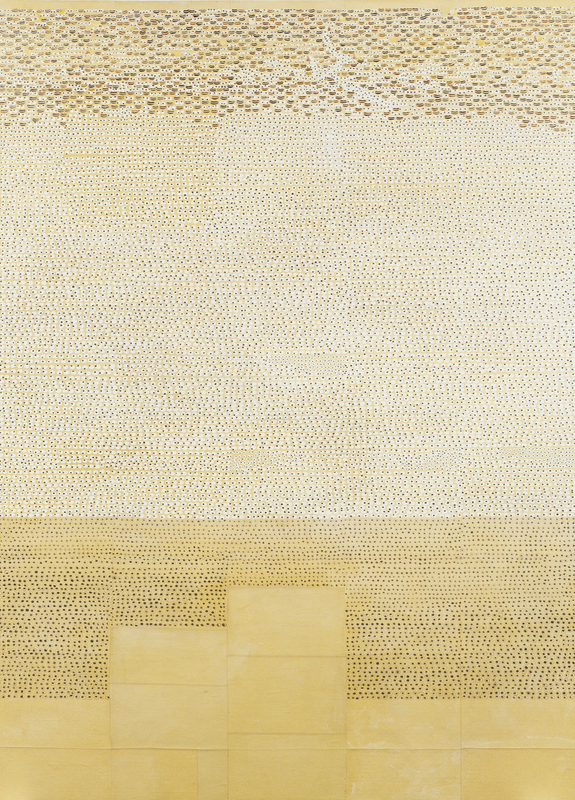 A glimpse at Ellen Gallagher’s paintings can be misleading: Grids of small circles on lined paper create the illusion of Minimalism. Step closer to examine those small circles, however, and hundreds of gleaming eyes and occasional rows of mouths are staring at the viewer. Ellen Gallagher, who has African-American and Irish parents, has loaded the calm surface with reminders of the derogatory huge rolling eyes and exaggerated thick lips seen on white actors performing in blackface as part of American minstrel shows a century ago. The artist uses lined pages from children’s composition books, suggesting the fine line between innocent doodling and harmful caricatures. Host, 1996, Ellen Gallagher (American, born 1965), oil and graphite on paper mounted to canvas, 69 1/8 x 49 7/8 in., Gift of Richard and Elizabeth Hedreen and the Margaret E. Fuller Purchase Fund, 97.6, © Ellen Gallagher. Currently on view in Elles: SAM – Singular Works by Seminal Women Artists, Modern and Contemporary art galleries, third floor, SAM downtown.